Norfolk had more than its fair share of rich and powerful families in the 14th and 15th centuries. The Pastons are more famous than most because of the letters they left behind, and we know more about them because of this. In published form, the letters are often hard work, but provide intriguing glimpses of the life of the county set on the eve of the Reformation. The family weren't actually top notch; but, like many second rank county famiies, they derived a long term benefit from the Black Death, stepping into the shoes of larger land owners as estates broke up, and enjoying the fruits of rising market prices. In fact, the Pastons turn out to be rather a colourful lot, spending much of their time feuding with neighbours, forming unsuitable relationships, getting into debt and generally doing the kind of things things that would qualify them to appear on reality TV shows if they were alive today. 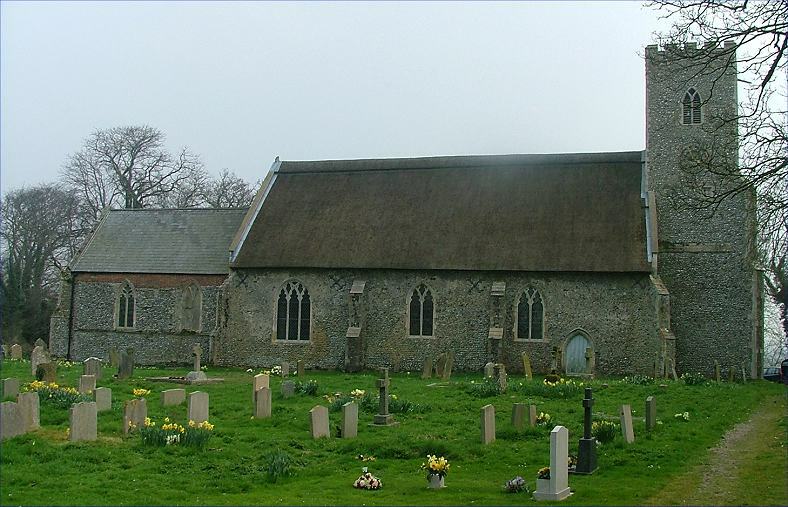 The Pastons glorified Broomholm Priory near Bacton with their money, and were buried there. 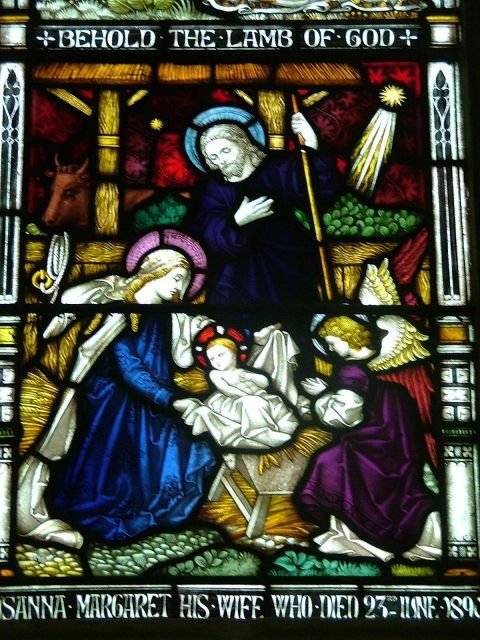 Their local church, St Margaret, was left a comparitively modest affair, despite being beside the Hall. The window tracery suggests that what remains is essentially the 14th century rebuilt church; one chancel window is blocked, and we will come to the reason for that in a moment. The porch was added as a 15th century afterthought, by no means as grand as most that century. We came here on a bright day in early Spring, and found preparations for a wedding underway; the church was being filled with flowers and foliage, while the Minister and the wedding party were practicing on the chancel steps. But everybody was very welcoming, and nobody seemed to mind that we were looking around. A less fantastic reminder of mortality can be found up in the chancel, where there are several memorials to the Pastons. They are a curious assortment; the older ones are believed to have been brought here from Broomholm when the monastery was closed by Henry VIII, one of them crudely reset in front of the sedilia as if to prevent any further ceremonial use of the seats. On the north side, and the reason for the blocking of the window, are two enormous memorials by Nicholas Stone, one featuring the life-size Dame Katherine Paston, who died in 1628. She reclines beneath a vast wedding cake of pink and cream, a pediment above topped off with more figures and a crest. One assumes that she wasn't a puritan. 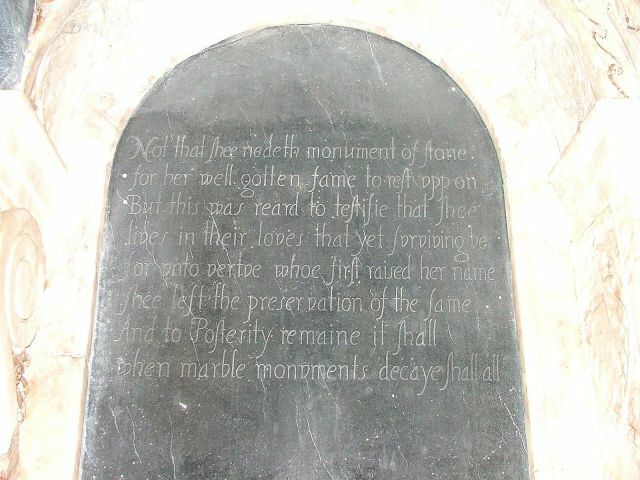 Her inscription is rather jolly, and assures us that not that she needeth monument of stone for her well-gotten fame to rest upp on, but this was reard to testifie that shee lives in their loves that yet surviving be. For untoe virtue whoe first raised her name shee left the preservation of the same, and to posterity remaine it shall when marble monuments decaye shall all, which doesn't quite scan, but you get the point. I rather think you would wait an awfully long time for this monument to decay, and I would in any case sooner wish that fate on the ugly one beside it. Also apparently by Stone, it is a rigidly formulaic classical memorial featuring an urn. Horrible. The memorials are vast, but don't completely overwhelm the chancel, which is enhanced by some very good 19th century glass. This aside, there is little of excitement; I was pleased to find the original handwritten roll of honour from the First World War, one of several in churches around here. Outside, the great Paston tithe barn has been under restoration for almost a decade. Work can only be done at certain times of the year, because the barn is home to Britain's only known maternity colony of the very rare barbastelle bat. Originally, the plan had been to turn the barn into an exhibition and conference centre; but now a fifty year lease has been granted to English Nature, and so for the next half a century the bats can get on with their little batty lives in peace.